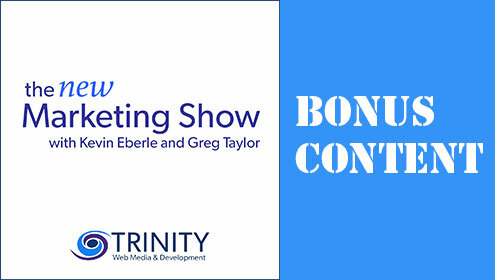 Trinity Web Media’s marketing podcast The New Marketing Show publishes two bonus podcasts a week. This content is available for free to our podcast subscribers via iTunes and/or the podcast app of your choice. To date, there are over 50 bonus shows available for your listening. Why all the bonus content? That’s easy. Trinity Web Media produces tons of content for our company. Some of this content is created for Instagram, Instagram TV, YouTube, our blog and our marketing podcast, The New Marketing Show. The best content is fluid enough to move platform to platform and can be leveraged accordingly. Some of the bonus podcasts are from past WordCamps we attended, Trinity Web Minutes, special conversations between our team or long form YouTube videos. In this special Bonus Episode of The New Marketing Show. Greg Taylor speaks with Trinity’s Director of Social Media Tami Harvey about their 10/10/10 Instagram strategy. Check out these shows for some quick hitting marketing insights and see how you can apply them to your business. If you can’t find what you are looking for, drop us a line and let’s see how Trinity Web Media can help solve your problem.